I read once that you should be nasty to nasturtiums. Unfortunately, I can no longer put my grubby little gardener’s hands on the article that said this, and I haven’t seen exactly the same advice anywhere else. Turns out you shouldn’t be downright mean to these pretty flowers with lily-pad shaped leaves. They don’t like to be transplanted, so it’s best to sow their seeds directly into the garden or containers, or in hanging baskets, as I’ve done this year. They need regular water and prefer lots of sun. So I think the notion of treating them badly probably got started simply because they can grow just fine in poor to ordinary garden soil. If you give them extra nitrogen, you’ll wind up with more foliage than flowers–so okay, you can be stingy when it comes to feeding them. I haven’t had great luck with nasturtiums in the past, and maybe it’s because I planted them late, and when the hot, humid weather set in, they turned up their toes and died on me. This year, I started the seeds in March, and so far they haven’t minded a few cold snaps and cloudy days. I’m hoping I get some nice hanging baskets filled with trailing vines and lipstick-red flowers to enjoy. 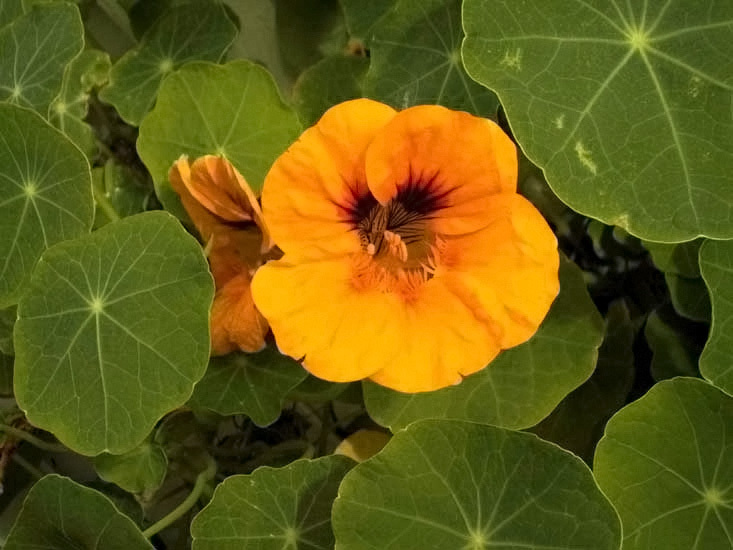 And hey–if I get tired of looking at my nasturtiums, I can just eat ’em! Nasturtiums, as long as you don’t treat them with any chemicals, are edible and the colorful blooms are snazzy looking in green salads. The blossoms have a peppery bite that I’m not overly fond of, but you can tone down the taste by mixing in some of the buttery, milder lettuces. Sadly, nasturtiums like that aren’t around anymore. That’s why we should grow heirlooms, to keep the old varieties going. If you’re looking for nasturtiums to grow this year, better get started soon if you’re in the South, or wait until fall returns. You can plant then and expect your nasturtiums to flower the following spring. Try this site Renees Garden for a great selection of nasturtiums. ‘Empress of India’ is a gorgeous heirloom with bright red flowers.